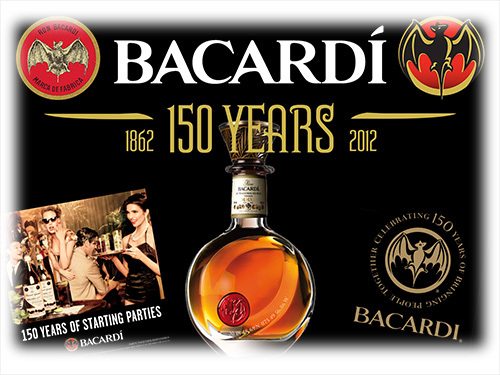 In 2012, Bacardi will celebrate their 150th birthday and by the looks of things, everyone’s invited. When Don Facundo Bacardí Massó purchased a small distillery in Santiago de Cuba on the 4th February 1862, little did he realise that he would be laying the foundations for a business that would go on to become the world’s largest privately-owned spirits company and that Bacardi would one day be the number one selling rum in the world and that it would be sold in over 150 countries worldwide, having won over 400 awards in its lifetime. While there have been many positives over the years there’s also been the odd bump in the road. The biggest of these was the confiscation of Bacardi’s Cuban interests in 1960. Fortunately for the Bacardi family, they had already long since opened additional distilleries and production facilities in Mexico and Puerto Rico. Fortunately for Bacardi it was a decision taken over 20 years earlier that would ensure the company’s survival beyond their forced departure from Cuba. Despite this, Bacardi is very proud of its Cuban heritage, as well as its importance and impact on the rum industry and the somewhat impressive numbers that they’ve stacked up over the years. And proving that statistics don’t always have to be boring, take a look at the following quirky Bacardi “Fun Facts” video. So here we are in 2012 and Bacardi is ready to celebrate 150 years of “bringing people together” and who better to throw a party than someone who’s been helping others do it for 150 years. Throughout the year, Bacardi will host one-of-a-kind birthday parties, launch special promotions featuring 100 years of ground-breaking advertising, introduce a $2,000 limited-edition decanter of rare BACARDI rum, offer travel retail exclusives and commemorative gifts, and much more for consumers to come together and share in the excitement. Global Cocktail Competition: BACARDI will shake things up this year with a special edition of its Legacy Cocktail Competition, drawing mixologists from more than 25 countries to the finals in Puerto Rico on February 20. Enjoy the rare $2,000 Ron BACARDÍ de Maestros de Ron, Vintage, MMXII®. Created especially for the 150th anniversary, it is a blend of the finest rums laid to rest in oak barrels over the last 20 years and finished in 60-year old Cognac barrels, this vintage blend is presented in a hand-blown 500ml crystal decanter housed in a leather case. Birthday Cruise: Celebrity Cruises® will mark the occasion with a February 4 party aboard the Celebrity Summit® as it departs from San Juan, Puerto Rico. For more details on what’s happening and how you can celebrate Bacardi’s 150th Birthday, keep an eye on www.facebook.com/BACARDI and www.BacardiLimited.com/150.